When I first started playing tennis, it was in 1999 – August of 1999 actually. At the time I was dating a girl in college. She was a tennis fan and I was a tennis fan and we thought it would be a lot of fun to go practice or get warmed up for this camp we were going to. And while I was out there, I was in my every day chair – no sports chair specific. No strapping. Nothing on. I was holding the racket with no assisted device, with my hands that are partly paralyzed. As soon as the ball would hit the racket , the racket would fly out of my hands. There was no possible way for me to hold it. 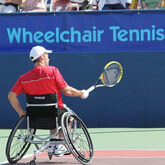 I just kept telling myself, there is no way quadriplegic plays wheelchair tennis. Thankfully, I didn’t believe that – I just said it. I learned how to hold the racket. I use athletic tape. I tape the racket to my hand, so it is stuck in one grip the whole time. It never changes for the duration of my training or my match – and that could be an hour or three hours. It just depends on the duration of the match. I would just suggest again that you get out there and try it. And you adapt. You make do with what you have based on your disability. That’s exactly what I did. I didn’t let it stop me. My love was tennis and I found that again – just in an adaptive way.